Indigo veröffentlichte bei Lielow Records die CD „Stay together“. Dian Pratiwi – Guest-Singer on “You are the sunshine of my life” and “What´s going on”. Es gab Internationale positive Resonanzen auf die deutsche Smooth-Jazz-CD des Jazztrios. 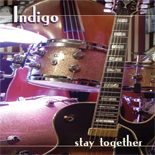 The German trio Indigo is illuminated by the stirring soul of Al Green on their new album, Stay Together. The name of the record itself is a nod to the great reverend, whose 1972 classic “Let’s Stay Together“ is also covered here with a smooth-jazz sheen. Featuring Jost Edelhoff (acoustic and electric guitars), Michael Thomas (acoustic bass), and Carsten Steinkämper (drums and percussion), Indigo display their deep affection for ’70s soul on Stay Together. Not only is Green paid tribute to but also his peers Stevie Wonder and the late Marvin Gaye. Green is given the opening slot with “Let’s Stay Together,“ and it provides a warm introduction to Indigo’s sound, which is primarily acoustic and unified by Latin rhythms and smooth textures. “Let’s Stay Together“ borders on light funk as well, but the soothing, mellow vibe is framed by Edelhoff’s tasteful, crisply produced guitar playing. Edelhoff’s instrument of choice seems to be a nylon string guitar, and on Indigo’s makeover of the often-remade “Girl from Ipanema,“ it radiates with a transcendent glow. Edelhoff’s playing is fluid throughout, especially on “Take Five“ and Wonder’s “Isn’t She Lovely.“ Indigo strips “Isn’t She Lovely“ of the Adult Contemporary blandness it has since absorbed over the past few decades and reinvigorated it with an achingly pretty jazz arrangement. The instrumentals are gorgeous; however, when Indonesian vocalist Dian Pratiwi takes the microphone, Indigo sound even more inspired. With its powerhouse socio-political message, Gaye’s “What’s Going On“ is certainly timeless but the original is such a classic that it is almost sacrilegious to cover it. But Pratiwi sings it with a peaceful croon, a subtle approach that reveals the tune’s hauntingly pretty melodies. Indigo supports Pratiwi with a thumping Cuban beat on Wonder’s “You Are the Sunshine of My Life.“ What is old becomes new again in the steady hands and bright vision of Indigo. Für Radio-Redakteure bieten wir hier eine Radio-Zusammenstellung (radio-sheet).